Writing is hard, frustrating, and it costs a lot of time. You’re trying hard, but you just can’t seem to get a coherent text on paper. And still, you know more than enough about your subject. Sounds familiar? By first making a bullet list, you can improve your writing process and your result. How do you start writing? Most people wait till the deadline is due before sitting at their computer. They type a first sentence, then another one, and one more. And at a certain point they get stuck. In fact, it is kind of weird to start this way. When building a house, one would always start with a design before placing a first brick. First you think, then the action follows. A bullet list can help you to work on your text in similar fashion. To write based on a bullet list has three major benefits. By making a bullet list, you reserve a moment for structuring your story. This makes it easier to improve your structure. If you start writing on the spot, this becomes more difficult, because then you write and structure at the same time. The structure provided by your bullet list will later help your audience when reading your text. If a clear structure is absent, your readers won’t find their way through your story. They have to work hard, will drop out, or will misunderstand your message. The more complex your topic is, the more important a clear structure becomes. Scientific research also shows that readers find texts better and more coherent when they are based on a written outline prepared during prewriting. A growing number of our hospital beds are left empty. Complex care increasingly takes place at home. In case of specialist treatments, patients more often choose a specialized hospital than a small hospital like ours. It is expected that in 2020, 25% of our hospital beds will be systematically unoccupied. This is a national trend. This expectation is based on figures of research agencies specialized in healthcare data. The costs of our building remain the same, hence we are running into financial problems. Calculations show a shortage of € 0,4 million in 2020. Over the last months, the relocation of complex care from hospital to home has been faster than expected. So maybe the calculations are even too optimistic. Compared to paragraphs full of text, it’s easy to keep track of the main structure and set all details aside. Adding, moving or removing content is simple. 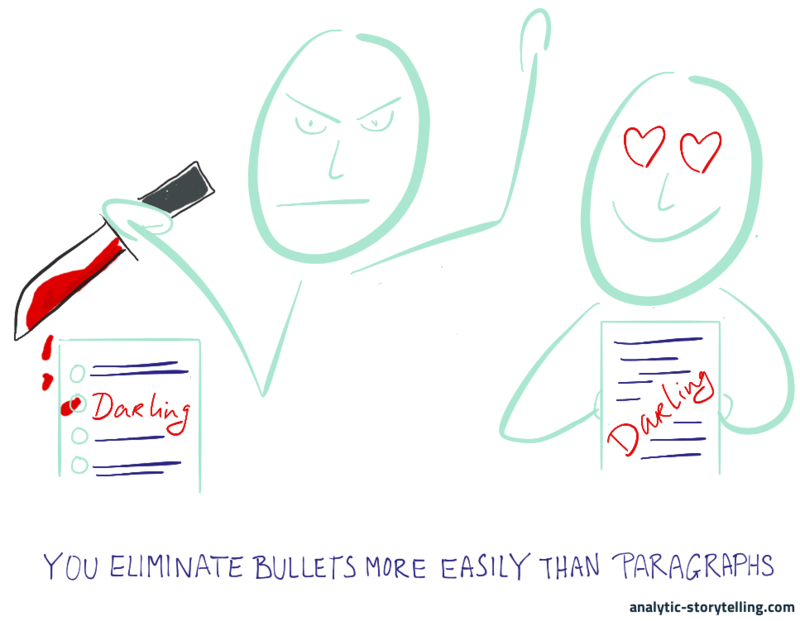 Psychologically, it is easier to omit an idea, even if you are attached to it (‘kill your darlings’), if it is represented in a bullet rather than a paragraph. For example, is it really relevant in our case that this concerns a national trend? Or consider the sub-bullet about the expected shortage. You might turn this into the first main bullet and see what this means for the storyline. It is much more difficult to consider such different orders or regrouping of details if you already have your text. One extra benefit of a bullet list is that you can discuss your storyline in an early stage. I do this myself, for example with clients in storytelling sessions, with participants in trainings, and with colleagues when writing blog articles like this one. When writing on complex topics, your text quickly becomes abstract. The text on the healthcare boulevard, for example, would go on about such things as healthcare substitutes average length of stay, primary care, business cases or stakeholders. In these cases, to make your text more appealing and easier to understand, you should add examples. If you know all about your subject, you often have many examples at hand, and they all seem relevant. How do you integrate these in your text without making it chaotic? Again, the bullet list can help. The boulevard of healthcare improves the connections between healthcare providers, causing the quality of care to increase. [example] A patient visits her doctor with speech impediments. The doctor concludes that it’s a stroke and sends her to the emergency department. To prevent brain damage, she has to be there as quickly as possible. If the doctor’s office would be located on the boulevard, she would be there in two minutes. When you place an example under a main bullet, you are certain that it fits in your argumentative structure. Hence a bullet list makes it easier to decide which examples to include in your text and where to place them. 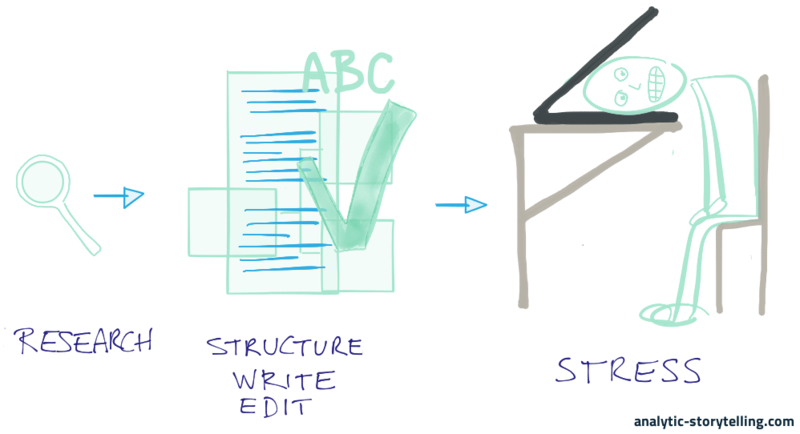 If you do your structuring, writing and editing all at once, you give yourself a heavy cognitive load. As a result, you get stuck, or you fall into task avoidance. For example, you find yourself making literature references, while you intended to structure your text. You work better when you do one thing at a time. Psychologically, any (writing)project is less heavy when it consists of distinct subprojects, structuring being one of them. This is why some argue that making an outline can help you eliminate writer’s block. After the research phase, making a bullet list is an easy task to begin with. And once you have a good bullet list, it becomes clear how to proceed with the actual writing. After all, you have already done a lot of preparatory work. You know what you want to say, you have a sound structure, so you can focus all your energy on your text. This way, you might even get the feeling that the text is writing itself. The pomodoro technique is a practical technique to make sure that you only do one thing at a time. You set a timer to 25 minutes and decide beforehand what you want to do, for example, building a structure with a bullet list. When the alarm goes off, you take a short break. Then you choose whether to continue working on your structure, or whether it is time to start writing. Accordingly, a bullet list helps you to write easier and faster. You will earn back every minute that you invest in a bullet list with interest. A writer who argues that he couldn’t make a bullet list because of a deadline, is making a paradoxical claim: I have no time to write efficiently. That’s like a lumberjack who’s too busy to grind his ax. Arnaud is trainer, advisor and text writer at Analytic Storytelling. He helps customers to send out a clear and convincing message in both words and images.